Considering other Blender short films I've seen, I'm actually very impressed with the sync and voice work. I mean the other stuff is nice, but that especially. 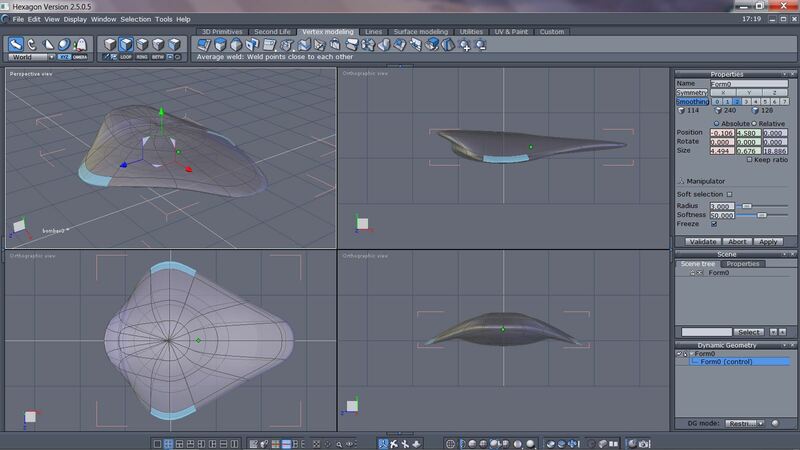 If anyone has tried to use Blender and failed miserably (like me), take another look. It is simply THE Best Deal out there. Not just because it's FREE, but because it also is extremely powerful. not that difficult to learn. And no false modesty, if I can do it, trust me, anyone can do it!!! The new Cycles renderer is wonderful, and blazing fast when used with an NVIDIA CUDA GPU......e.g. since it is so fast (with CUDA). I still use and love Carrara & Bryce, but highly recommend Blender. It does amazing physics animations. Here's an overview of the new improvements in just released 2.64. The best adjective to describe Blender is not "hard'......it's "awesome"! *Cough* Well,don't witness the Sintel video if you're easily depressed. It suffers from Short Film Ending Syndrome. It is a fantastic piece of work, though. Old Yeller is depressing...Sintel is a ton of bricks dropping on your kitten, the day your car dies on your way back home from a root canal kind of film. I agree. Sintel was ... IS an amazing piece. I was under the impression that we were going to have an abrupt ending but it ended well but left you wanting more. I can't believe all that was achieved in Blender. The part where she is going through the bamboo jungle was just so vibrant and lovely. The Dragons were exceptional and the old wise man.. WOW! The main character was very likable and you wanted to see her succeed and felt her pain as she realized her fatal mistake. that video only prove to me, that programs like carrara and bryce where good and fun in the past and today are a waste to learn. i never seen a video so good like sintel created with carrara or even bryce software. and Carrara7Pro (may be free sometime soon?). huge amount of content that come with both. And Hexagon is a decent modeler. Oh? What do you use Metasequoia for? but after seeing what David Brinnen has done with it, I need to spend some time with it for sure. a major stumbling block for me (and many others). To each his own. There are so many versions to choose from (if you don't need the latest & greatest). of free tutorials for it as well. It's especially good for physics sims, e.g. fluids & softbodies. I like Carrara best for bullet physics, and animation. VUE for terrains & skies. Bryce for abstract art, certain terrains, and materials. Old Yeller is depressing…Sintel is a ton of bricks dropping on your kitten, the day your car dies on your way back home from a root canal kind of film. ....LOL! I missed that earlier.......I was only im-pressed, not de-pressed as I still haven't seen the whole thing. ...until they come up with a "default" camera in the editing window that can be controlled using a pointing device (like other modelling apps have) instead having to key in your movements all the time, I still find it cumbersome to work with. Something like the Daz "Camera Cube" would be a vast improvement. a Point At Modifier on the camera and a Target Helper Object. And you can always save it as your startup scene. use keyboard shortcuts......not in a hurry. I always use keyboard shortcuts in pretty much all my apps, because of chronic CTS and the need to use a pen and tablet instead of a mouse. I can't use the Camera Cube in DS because the pen doesn't give me any control, whereas a mouse would, but would cause me a fair amount of pain after a short time of use. I don't have any clients or deadlines to meet. I use the mouse and touch pad without pain now. Ohhhh Arnica Cream. When I was still studying dancing years ago, the arthritis in my left knee would really hamper me. Then one of the ladies at the studio I was studying at told me about Arnica Cream and it helped. Of course, since joining a gym in 2005, and using the Leg Extensions machine regularly, my knee is very mobile and not painful any more. As long as I leave it on for about 1-2 hours afterward, my arm feels no pain any more. My personal trainer suggested it. Ummm....this is in 2.64, but I don't know how long it has been in Blender. re: Lock to Object......I knew there probably was more than one way, there usually is. A little late for replys on this thread. My apologies. I was working from a great tutorial yesterday from VscorpianC (Youtube Blender Tuts Channel: https://www.youtube.com/playlist?list=PL08F12EB42C5FC51B ) on how to modify the new Toolbar Tabs in 2.70 via Python scripting, and I modified the "3D Navigation" Tab (Addon by demohero, and uriel. 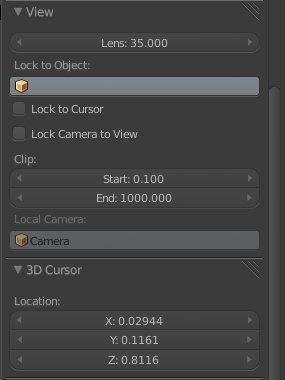 I believe already included in Blender 2.70, but can be found here if not: http://wiki.blender.org/index.php/Extensions:2.6/Py/Scripts/3D_interaction/3D_Navigation ) to include a "one-mouse-click" (left-mouse-click on button in tab to activate - no need to hold mouse button, and left-mouse-click anywhere in 3D viewport, or button again, to deactivate) action for basic 3D View camera usage. There are three buttons. One for each action respectively; Rotate, Pan, and Zoom. 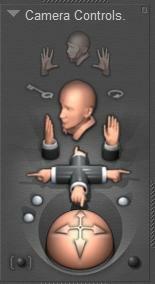 I know it is not a 3D Camera Cube, or on-screen usage buttons like those in DAZ Studio, or Hexagon, but it is at least something that does not require one to use any keys on the keyboard. You need to activate the 3D Navigation Addon in User Preferences, and it will propigate in the new Toolbar Tabs. First, you have to replace (backup original) the addon Python script with the modified one, and don't forget to save as UI preference, so it remains upon closing/re-opening Blender. Let me know if you would like me to send you the modified script. I checked out your site, and you did a terrific job on it. Very pleasing, and informative. Thank you for all your hard work, and devoting your time and resources to create it. I use Metasequoia for basic 3D painting, sculpting, quick mesh fixing, and modeling that Wings3D can not handle due to it's winged-edge data structure, like double-sided facets, facet modeling, and vertice rips/welds. Also, as a Cel render primer for renderer's such as CelsView, Vidro, and it's own default renderer. ...I know zilch about scripting. and frankly at this stage of my life and artistic career, am not interested in learning it. Having to write code for creating graphics back in the 80s is what chased me away back then. As I used to be involved in traditional art media for most of my life before arthritis took that away, I approach 2D/3D CG from an artist's, not a programmer's point of view. Blender could well be the only computer program I have ever used where within 15 minutes of playing with it cold I was not able to figure out how to use it. There are things that are pretty much standard across every PC program. You right click on something, you select it. You left click on something, you bring up a menu for it. And even though there is variation in camera controls with every program I can pretty much figure them out quickly enough. Blender. Nope. Barely get any camera control and right clicking just moved a weird target thingy around the screen. The user interface is bombarding me with dozens of windows and menus and none of them are telling me what I want to know. That the Blender community wanted Andrew Price's head on a pike for suggesting that maybe it was time to give Blender a proper industry standard interface pretty much showed me all I need to know about Blender. It's not going to change because the community 1) refuses to acknowledge it needs change, and 2) actively want new users discouraged from using the software. I'll stick to 3D Coat and enjoy having a clean toilet too. I haven't used Blender since something like 2007. I think I managed how to make a vase and add a texture, but the whole thing left me scratching my head. I've come a long way since then, so maybe it's time to revisit Blender again. I plan to buy a 3D printer soon anyway, so it's only a matter of time before we'll need to get reacquainted.